(Nanowerk News) The physicist and Nobel Prize winner Wolfgang Ketterle once described it as an "identity crisis" of the atoms: If atoms are caught in a trap and cooled to a temperature close to the absolute zero point, they condense – similar to vapour to water – and take on an all new condition: They become indistinguishable. This collective condition is called - named for its intellectual fathers - Bose-Einstein condensate. Physicists at the Physikalisch-Technische Bundesanstalt (PTB) have now succeeded for the first time worldwide in producing a Bose-Einstein condensate from the alkaline earth element calcium. The use of alkaline earth atoms creates new potential for precision measurements, for example for the determination of gravitational fields. Because as opposed to previous Bose-Einstein condensates from alkali atoms, alkaline earth metals react one million times more responsively to the wavelength at optical excitations – a fact which can be used for super exact measurements. Theresults have now been published in Physical Review Letters ("Bose-Einstein Condensation of Alkaline Earth Atoms: 40Ca"). Like a giant wave in the midst of a sea of gaseous calcium atoms, the Bose-Einstein condensate soars. It is composed of approx. 20 000 atoms which are normally not visible to the human eye. However the waves which describe the atoms quantum mechanically, all oscillate synchronously in the condensate and accumulate to form a dense giant wave. In this way, the microscopic pile-up of atoms suddenly becomes macroscopic and therefore visible. Atoms in gases at room temperature behave like a wild bunch: They fly pell-mell at different speeds, collide with one another, and are then hurled again in another direction. However at extremely low temperatures close to the absolute zero point at zero Kelvin (–273.15 degrees Celsius) they nearly come to a standstill. At this point, the laws of quantum mechanics come into effect; these cannot be observed in everyday life and have an unsettling effect on many a non-physicist. The idea of atoms as small spheres does not work any longer. In fact, atoms can now only be described quantum mechanically by waves. Like water waves they can overlap each other. In the case of a Bose-Einstein condensate, the wave functions of up to one million atoms are so synchronised that they pile up to form a giant wave. These formations can grow to one millimeter in size and they can then be photographed. The microcosm presents itself macroscopically – it becomes visible for the observer. 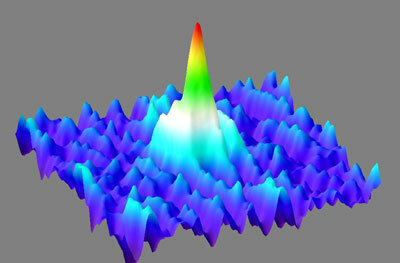 In the past few years, such Bose-Einstein condensates have been used for diverse investigations on the fundamentals of quantum mechanics, as a model system for solids or in quantum information. The wave patterns of excited Bose-Einstein condensates are very responsive to their environment. Thus, by investigating these patterns it is possible to produce highly responsive interferometric sensors, e.g. for magnetic fields but also for gravitation. For the manipulation und excitation of condensates light is used. All Bose-Einstein condensates produced so far worldwide have a common disadvantage: Their broad optical transitions do not allow any precision excitations. In the case of Bose-Einstein condensates from alkaline earth atoms (e.g. calcium and strontium, both of which are being investigated at PTB as to their suitability as optical clocks) their super-narrow optical transitions offer novel potential for precision investigations. Conceivable is their use on satellites, e.g. by geophysicists, who study the deformation of the Earth and thus the change in gravitation. At PTB it was possible for the first time worldwide to produce a Bose-Einstein condensate from alkaline earth atoms. To this end, 2·106 calcium atoms precooled in a magneto-optical trap were loaded at a temperature of 20µK into optical forceps. Due to the weakening of the holding force hot atoms vaporize, whereby the remaining atoms are cooled. At a temperature of typically 200 nK the critical temperature is reached with 105 atoms. Of these, approx. 2·104 atoms can be cooled to form a pure condensate.